Finally, it is a perfect time to begin to discuss about one of the most anticipated games of 2017 Mass Effect 4: Andromeda. Especially, as most of you have already found out that the game will show up not later than a few months later. Of course, we still have some doubts about the actual release date, since the developers of the game BioWare do not seem to be so ensure itself. The only thing we can guarantee is that the game is worth to be waiting for. The Mass Effect Andromeda will bring a new galaxy as well as the endless adventures that will make the game be super exciting. Not to mention, it is also the very first Mass Effect game, where the Frostbite engine was used. In other words, this time, the game is perfected according to the latest technologies. So the story line, visuals and of course the soundtrack will definitely surprise even the most grumpy ones. Moreover, Mass Effect 4 will be able to be played on PC, Xbox and PlayStation as well as on PS4 Pro. Playing on PS4 Pro you will not only get the best version of the game, but you will also stimulate your imagination at the highest level. So, let's begin with the very minor details about the Mass Effect Andromeda gameplay. As Mass Effect Andromeda was first time mentioned more than a year ago, even then, it was one of the most discussed games of all time. Everyone was wondering what the game will be about, what characters will dominate and if it will have the similarities with the previous Mass Effect 3. Telling the truth, this time the Mass Effect Andromeda plot will definitely differ from all previous Mass Effect games. For the very first time, the players will have the possibility of choosing from two different characters. A women Sara and a man, Scott, who are actually a sibling. This kind of situation was unexpected, however, it received a great publicity. Therefore, before starting the game everyone will be free to choose their favorite character. In other words the Pathfinder. If you still do not know the main mission of the game, then is time to face it. Each of your mission will be the same. To find a new planet, suitable for a new, peaceful life for the rest of humanity. Not a secret, this time the game will be controlled from the third-person perspective. However, what really amazes is the changes in the class system. In order to have a certain power, no longer you will have to choose from a limited list that comes together with a game character. The game options will allow to choose your desired power skills just before a battle. 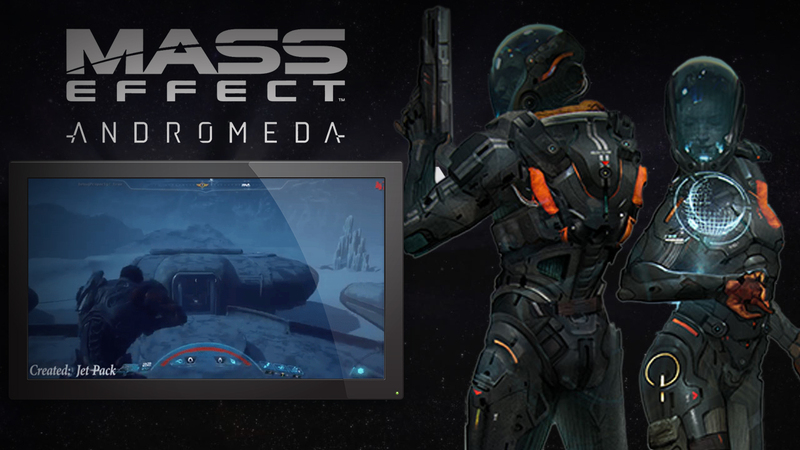 Also, according to a new Mass Effect 4 storyline the gameplay will be more flexible and unique. Since the action will be held in the mysterious and huge galaxy called Andromeda, you will be able to visit many other planets that each has their own advantages and disadvantages. Slightly above, you can see a detailed trailer that represents a true story of the game. As it was expected, the trailer begins with a strong frame, where the main character of the game turn back to the earth for the last time. As you can hear, the background voice quite strongly emphasizes that this trip has only one and the most important mission, to find a new planet for a mankind. Not to mention, the emotions in the video get much more serious when the character gets to the tremendous spaceship and realize that this trip will not have the return ticket to Earth. As it is clear enough, the action in the game will take place at 600 years from Mass Effect 3. Thus, many different spaceships, strange creatures as well as aliens will not be a surprise. Moreover, according to this video, we can comprehend that the Pathfinder will have to carry out more responsibilities than it was expected. A soldier, scientist and guide. By the way, the pathfinder will also have a classified information about the most important things. Such as detailed description about the Nexus overviews, Ground and Space vehicle certification, establishment guidelines, first contact protocol, weapons, antibiotics and finally a survival training that will help to stay alive even in the most dangerous planets. However, if you as a player will succeed to find the right planet, you will do the impossible. Thanks to you the humanity will be able to build a new feature and a new home. We are not sure if such a Mass Effect Andromeda plot sounds good to you, however, we sincerely believe it is much more exciting that previous Mass Effect 3 gameplay. New characters, new soundtrack, visuals and of course a new game control opportunities. But most important, new galaxy Andromeda that we all have been waiting for so long. Want to know more? Follow this article, since the news about Mass effect 4 Andromeda gameplay will be supplemented every week or so. Here you can find out more about Mass Effect Andromeda release date. You can also watch Mass Effect Andromeda trailer. Also there is an article with lot of information about Mass Effect Andromeda on PC (a personal computer).